"Parce que chaque chose se convie à regarder, on a tant à dire." Art student after the war, he began by studying watercolor and drawing and took the old houses of his home town as his subjects. His canvases evoke the area's placid rivers and the lakes of the Doubs region. He is a tireless draftsman and is commissioned to illustrate a book about Margaret of Austria and also produces a wonderful pen and ink drawing of the church at Brou, in the Ain region. As a young man he traveled many roads on his bicycle, even going from Besançon to Naples. A member of the French Alpine Club, he really discovers the Alps between the wars and immediately falls in love with the Chamonix Valley. He settles in Chamonix at the beginning of the 1936 and rents a small, modest room near the hamlet of Mouilles. During World War II he gets to know Savoy region. In 1940 in Chambéry he paints watercolors of the regions and the soldiers trained for mountain combat. Encouraged by his wife, Manite, he travels to all the high peaks carrying his heavy equipment. Trained to work with precision and speed he captures on the spot in a single session his favorite subject – mountains. In so doing he is often forced to endure the inclemency and fickleness of the weather. His precise brush strokes, his knowledge of geology of the places inspire original and vigorous work. His mountain paintings, basically painted on panels which he chooses because he needs their strength so he can work in such difficult terrain, win him loyal clients throughout Europe. Marcel will also immortalise the most stunning and picturesque scenes by painting chalets and hamlets, and these are a great success with the tourists who takes their holiday in the Chamonix valley. An expert geologist, Marcel also paints rocks. Commissioned by the City of Geneva and the Museum of Natural History, he produces drawings and paintings of the drilling of the Mont-Blanc tunnel at the beginning of the 1960s. He also produces geological panoramas of areas in the central Alps; they are now housed at the Geneva Museum. As a passionate student of ancient history, he loves painting frescos that he sometimes does for hotels and private clients. He paints panels depicting the history of the Dukes of Savoy for the Hôtel de la Couronne in Argentière. Marcel also paints several prominent military men with a real eye for fine historical detail, and this brings him back to one of his childhood passions – lead soldiers. 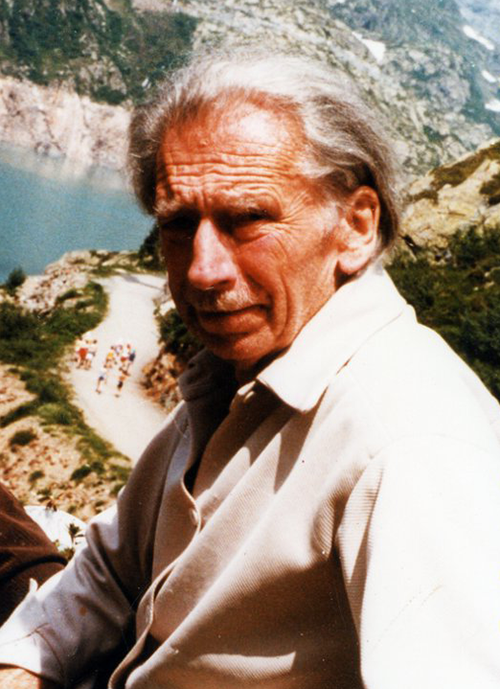 Marcel WIBAULT joined the Society of Mountain Painters in 1976, and was its senior member until his death in Chamonix in February 1998; he was still painting there just a few days before passing away in his chalet. He was a prolific artist who left about 4,000 pieces of work, most of which have been acquired by French and foreign buyers.